In glorious sunshine The Allam British Open came to life at the KC Stadium today as the capacity crowd enjoyed four entertaining semi-final matches. It was a day of mixed success for England with both Yorkshire’s home hopefuls Nick Matthew and James Willstrop crashing out but there was better news in the women’s draw. England’s last British Open champion in the women’s event was back in 2001 when Lisa Opie lifted the trophy but tomorrow Laura Massaro has the chance to change the record books after she beat Egyptian Raneem El Weleily. Massaro’s route to the final of the Allam British Open was no easy feat against the Egyptian who took the first game 11/8 as the Brit struggled to find her top form. El Weleily started strongly and was soon 3-0 up and despite a dedicated effort by Massaro, she remained in front until the end. But Massaro reversed her fortunes in the second game taking the first point and going 3-0 up in a matter of minutes. A small wobble in the middle of the game saw El Weleily come back to 6-7 but that was Massaro’s cue to refocus her efforts to win 11-6. The third game became an almost mirror-image of the first, with Massaro this time taking the initiative and drawing first blood. The two players vied for position through a number of strong rallies and strategic front-wall play and matched each other point for point. In the end it was Massaro who again edged her opponent out to win 11/8. El Weleily started strong in what turned out to be the last game, going 3-1 up, then 5-2 and then 7-4. But the Brit, who could taste victory, pulled it back to 7-7, then 8-8 and then 9-9. In a tense ending to the match it was the Massaro who made it across the line first to win the game 11/9 and the match 3-1. Speaking after the match Massaro said she had found it hard to keep the prospect of reaching the final out of her head in the final few rallies. Nicol David was simply unstoppable in the first women’s semi final against England’s Alison Waters the Malaysian showed why she has been almost untouchable at world number one since 2006. Despite getting off to a good start in the first with the Englishwoman really struggled to find any answer to David’s speed and accuracy around the court. The fourth seed struggled to retrieve at the back of the court and David took full advantage taking just 27 minutes to move into tomorrow’s finals. “Alison started really well, but I was able to start imposing my game and it worked,” explained the world no.1. 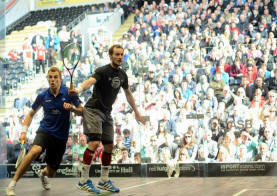 Nick Matthew’s hopes of a fourth British Open title were destroyed by Frenchman Gregory Gaultier in a fiery encounter in the first men’s semi final match of the afternoon. Matthew went on the attack in the first game, playing hard and fast, and trying to dominate his opponent. He quickly took the score to 4-0 and, looking to make light work of the Frenchman, took the game to 8-1. But Gaultier did not take the assault lying down and fought back,winning a massive seven points on the trot to level the match. Nine all followed but the Brit managed to take the last two points to win 11-9. By the second game, however, the Frenchman was setting the pace of the match and had Matthew on the run. He dominated from the off, going 4-0 up quickly and shortly after 7-2. Although Matthew dragged a couple of points back the inevitable was soon realized with Gaultier winning 11-6. The third game continued along the same lines as the second with Gaultier dominating from early on. Matthew fought back with some strong rallies but always missed out on the point. Gaultier reached game ball with the Brit just on two and although Matthew pulled one point back, the game belonged to the Frenchman who won 11-3. Realising his chance of a place in the final was slipping away, Matthew fought tooth and nail to get back into the match. In the first part of the game the two players matched each other point-for-point but then Gaultier again started to edge away to make it 7-4. Matthew pulled back to 7-6 but from there on the Frenchman dominated. A controversial video review at match ball looked to offer the Brit a lifeline but a rally later he was sent crashing out of the Allam British Open. The last semi-final of the afternoon was a repeat of last year’s at the O2 Arena in London with Pontefract’s James Willstrop taking on Egypt’s Ramy Ashour. In a highly entertaining match Ashour continued his unbelievable form, treating the crowd to an array of outrageous flicks, drops and nicks that literally made the audience whoop in awe. The first game was all Ashour as he raced to a 8-0 lead, with every attacking shot he tried landing perfectly in the nick much to the dismay of Willstrop. The Yorkshireman even joked with the world number one after an astonishing point saw the Egyptian casually take the ball from almost between his legs and land it in the nick. First game to the talisman after only six minutes. 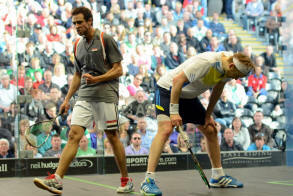 Willstrop came into the second game with the two going point for point to 8-8, the Englishman had started to move Ashour away from the middle of the court, stretching the game out to his advantage. At the crucial stages of the game Ashour was patient to attack showcasing not only his short game but finding the perfect length to take the second 11/9. A large contingent from Willstrop’s home club made the forty minute journey down the M62 from Pontefract and they certainly tried their best to lift the three-time British Open runner up. But it wasn’t to be for the 29-year-old who despite having a couple of game balls in the third will have to wait another year to try and get his hands on the coveted title.